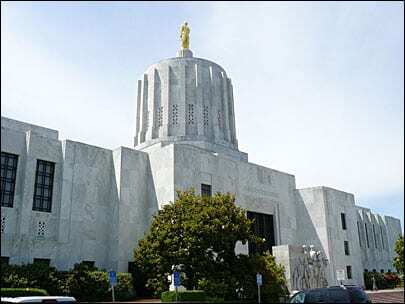 The Oregon legislature has introduced two bills aimed at making polluters pay more while dividing the proceeds among every Oregonian, a policy known as Cap and Dividend. One of the bills, HB 3176, similar to that introduced by Chris Van Hollen in the federal Congress this year, plans to introduce permits for emitting carbon, which will then be sold at auction. The amount of permits will be reduced over time, reducing the amount of carbon emitted while increasing the money generated, in turn increasing or steadying the amount of money divided between citizens. The other bill, HB 3250, would introduce a simple tax on carbon emissions, the revenue of which would also be divided between citizens. Either plan could lead to $500 – $1,500 being given to everyone in Oregon. This is not a Basic Income as it it is not enough to cover the basic needs for survival but it would be unconditionally granted to all, leading to some calling it a ‘partial basic income’. The plans are similar to the Alaska Permanent Fund which does not gain money from polluters but rather invests in the state’s natural resources with the proceeds divided between all residents in a yearly check. This check comes to an average of around $1,000 a year. If the auction plan is adopted in Oregon, income to citizens would eventually decrease and end as the number of permits to emit carbon is reduced and eventually stopped, though this is not expected to happen until around 2050. Sure glad they’re discussing this!